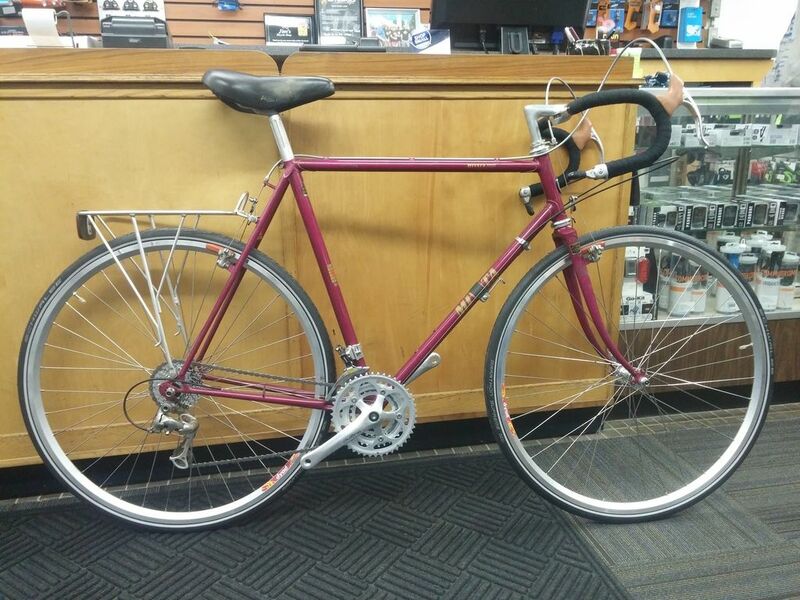 Bikes: 1981 Miyata 1000. fully restored.Original maroon paint with custom "speed chips". That looks like an absolutely first class, functional rebuild. I love that raspberry colour - never seen it before. Congrats! Among other things,... Nice Rack! Everything about the story is so cool, (with the exception of your dad completely effing up his back). I think you need to go into the details of the story (like how you dropped it off at a bike shop and forgot about it for 7 years- and the shop hung onto it for you!!!) and you need to go into the details of the build. Are you sure you're not a woman? That's some kinda reading between the lines! Rather than retype the whole thing, here's the original thread that began September 21, 2008. Last edited by Phreon; 11-09-15 at 11:34 PM. I look really good in a dress. Well you are from Wisconsin. Sweet Flickstand. Had one on a bike I refurbished earlier this year...cool little creation. Shame they failed once tubes changed diameter. I can't believe nobody makes a similar flickstand. Does Rhodegear stubbornly hold onto an un-used patent? The design, as is, doesn't work with bikes these days as pretty much all tubing is wider, and with so many varied widths, there would have to be just as many differently sized flickstands. It was a lot easier up until '87ish when 90+% of bikes had the same width downtube. If you're interested in discussing your bike, and getting opinions on what you've got going on there- this is the place to do it. A lot of people may not want to do all the hunting around for the story. If you're not interested in it, and just were sharing your joy and don't care about the particulars and just want to ride... that's great too. Best wishes and hope you've got some great weather for riding! 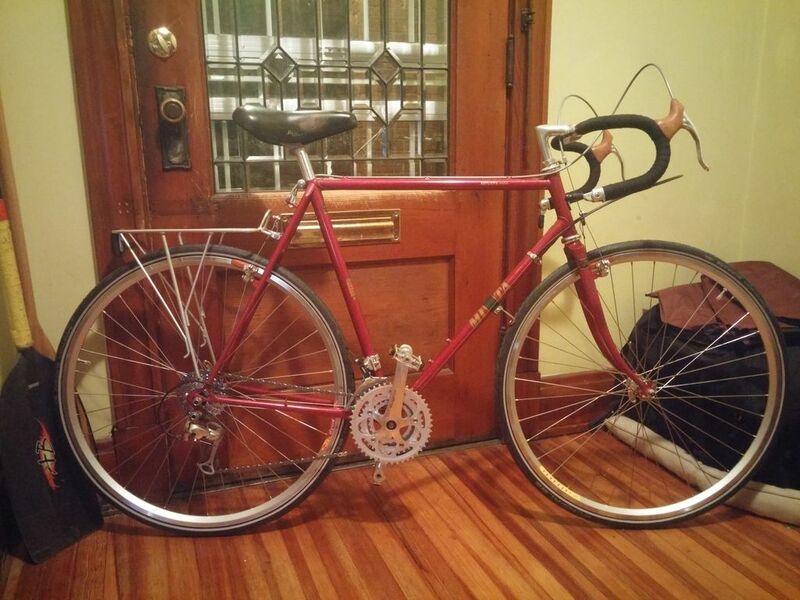 Love that Miyata, probably even more because of the color. I'll write something later. I posted that link since that thread is essentially the origin story, so to speak. I have it home. Been arduously trying to remove the framesaver goo that got on it. Paper towels and alcohol. I also need to adjust it. I hope I can get the stem high enough, or I'll have to replace it. Also, I rode it around in front of my house for a bit. Here's the thing, I haven't been on a road bike like this for at least 20 years. I've been on modern MTBs and hybrids, but nothing with skinny tires. And I've been riding motorcycles for the last 4 or so. HOLY HELL, if feels insanely twitchy. I need to take it easy for a while... I had to stay in the drops to stay under control. Here's the thing, I haven't been on a road bike like this for at least 20 years. I've been on modern MTBs and hybrids, but nothing with skinny tires. And I've been riding motorcycles for the last 4 or so. HOLY HELL, if feels insanely twitchy. I need to take it easy for a while... I had to stay in the drops to stay under control. Yowza! You're talking about about as stable of a geometry there is- I find the "touring bike" geometry to be the most stable next to the old, long wheelbase MTB geometry. I think you're really going to love it. It's probably just me being exceedingly rusty (and used to 500 lb. 2 wheeled vehicles), but switching from 27" to 700C shouldn't have been particularly noticeable, right? Um, my fish scale MUST be wrong. It's telling me as it sits, that bike is barely 25 lbs.! What??? It's steel! Last edited by Phreon; 11-10-15 at 08:17 PM. It went to the shop 7 years ago as a frame, forks, original Shimano 600 headset, Dia Compe 960 brakes and that rack. Upon discovering the drop-outs were old school 120mm, I had it cold set to 130mm. I later found the original stem, Suntour Gran Compe levers, Suntour Power Ratchet bar end shifters, SP seat-post and Avocet Touring I saddle in my parent's garage. The shifters and levers look brand new. I cannot explain how those old gum rubber hoods haven't shown the slightest bit of cracking, stiffness or stickiness after decades. This shop did all the labor: lacing the wheels, rebuilding the headset, upgrading and updating parts, tweaking and tuning. They essentially "gave" me the used derailleurs - they tried the Suntour Vx and Cyclone derailleurs I had, but said they just wouldn't upshift w/o a lot of "overshifting". The "new" ones shift smooth as butter, so I'm not complaining. This build was on a budget, but I was clear that I didn't want budget, bargain basement parts. And that though I'd like to lighten it a little, touring strength was the goal. Its a mix of new, NOS, used and stuff I already had. There are no major parts left that are hard to fix/replace or are otherwise unobtanium. Except for the frame itself, of course. Last edited by Phreon; 11-11-15 at 08:08 AM. That was my first serious bike. (That color, that model, 1981.) I rode it down the West Coast, Greece, England, Scotland and many rides in New England. I loaned it to a friend of mine in Berkeley the night of the 1989 quake and he got mugged and that was the end of that bike. It still breaks my heart, but he had it taken when he was trying to help someone who was being attacked, so I can't fault him for it. I replaced it with a Trek 520, but it just wasn't the same. Rhode Gear's not holding on to anything; they don't exist anymore. Rhode Gear got bought out by Bell, which went through some mergers/acquisitions/reorganizations in the '90s before eventually selling the Rhode Gear name and/or some part of their IP to Yakima. On a related note, I recently bought a Prorack hitch rack "by Yakima" that seems to be the current iteration of a Rhode Gear rack. Spare parts for my new rack are even listed as being for Prorack or Rhode Gear racks. Anyway, about that patent... It would've expired in 1994. If you feel the bike is remaining twitchy, it could be the headset needs service or adjusting. Darn it.......the 74 letour I picked up couple months ago had one of these "flick stands" but for the life of me I could not figure out what it was,so I took it off and pitched it. Cool device none the less. And oh yea,Phreon,sweet build.